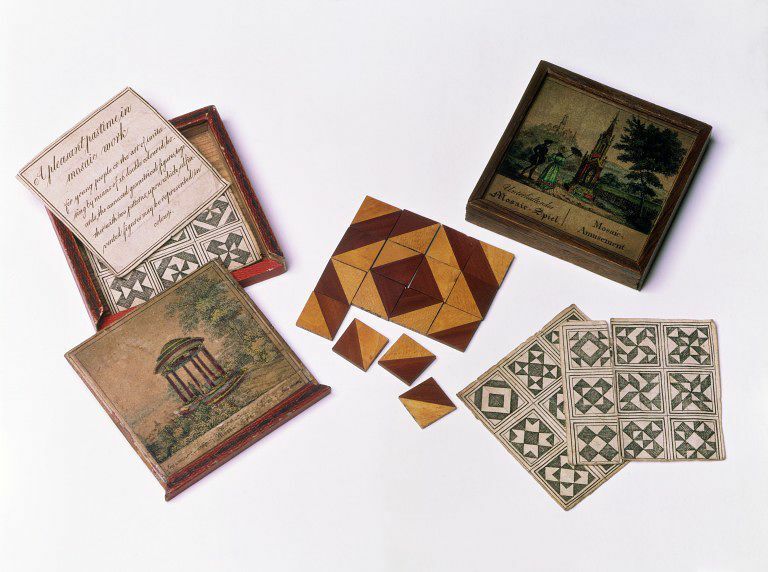 Part of a mosiac-amusement set that consists of 13 wooden pieces (from a set of 16) each consisting of a square formed by two triangles one of dark-toned the other of light-toned wood joined together, an engraved key sheet of diagrams and an engraved sheet of instructions. All within a wooden box with a sliding lid with an engraved pictorial label in German and English. 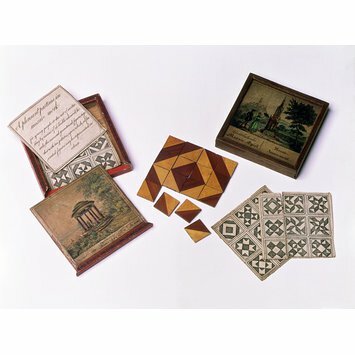 Part of a mosiac-amusement set that consists of 13 wooden pieces (from a set of 16), an engraved key sheet of diagrams and an engraved sheet of instructions. All within a wooden box with a sliding lid with an engraved pictorial label in German and English. Anonymous, German, ca.1825. Victoria & Albert Museum : Department of Prints & Drawings and Department of Paintings : Accessions 1954. Her Majesty's Stationery Office. London. 1963.